I use BitcoinAverage excluding MtGox to determine the US dollar price of Bitcoin. By this measurement, the Bitcoin price suddenly rocketed over a few days from the low 400's of last week to nearly double yesterday, before settling just shy of 600. 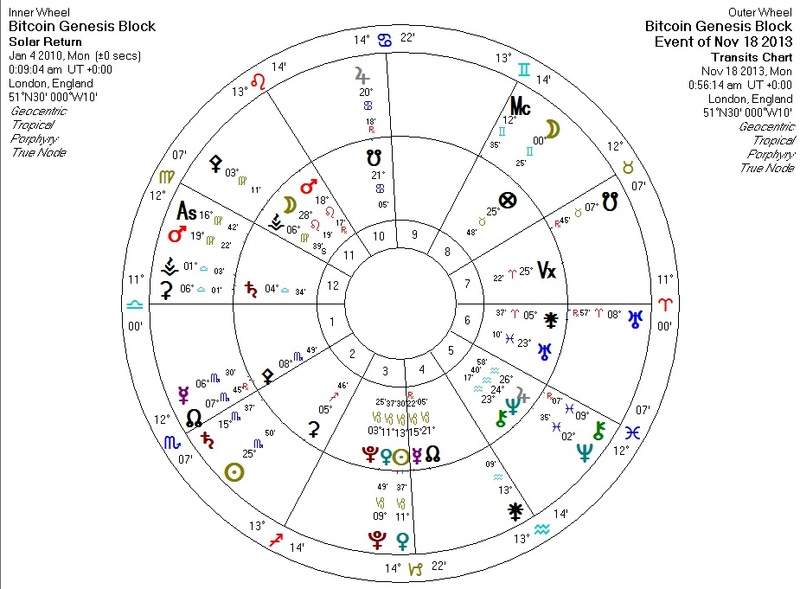 In terms of non-astrological news, this corresponds with yesterday's US Senate hearing on Bitcoin. Astrologically, we're looking at a fast-moving object for the trigger of this activity. Venus is the obvious one, as she approaches a conjunction within the next 48 hours to the Bitcoin Sun. But as the Venus-Sun transit hasn't quite peaked yet, we're at a loss using normal methods to explain why the peak was apparently yesterday. Enter the first solar return chart against the transiting positions for yesterday. Venus is still heading for the Bitcoin Sun. another spike (maybe smaller?) may occur in the next 48 hours. In any event, due to the Pluto and North-Node-declination factors described in previous posts I still expect a strong upward trend until these factors peak in January.